I figure I should start a project thread on my car. It's going to be a long project because I plan to drive the car while I restore it. So far I have added Cooper S brakes, new wheel bearings and spacer drums in the back and the addition of Group 2 wide flares and 10x6 Revolutions. Sorry for no pictures on the brake change, dirty hands don't do well with clean digital cameras. The most recent change is the refinishing of my dash and addition of Magnolia faced gauges. I also painted my dash surround matte black and put a new windscreen in. More to come in time. Actually I think that although the matt black looks OK, black crinkle would look better and be more in keeping - eg it would match the heater. Frosts sell it over here, I'm sure there must be a supplier in the US as well. asahartz wrote: Actually I think that although the matt black looks OK, black crinkle would look better and be more in keeping - eg it would match the heater. Frosts sell it over here, I'm sure there must be a supplier in the US as well. I tried the crinkle finish paint on the bottom rail and it looked ghastly. The manufacturer (PJ1) made the formula inconsistent and out of three cans of it, only one can worked. The one can just dribbled and the other didn't work at all. I finally just sprayed it with the matte finish to get it over with. I do agree that it would look fantastic with the crinkle finish and I will research a bit to find the one that will work. I don't mind removing it all and trying again. Another thought would be some of the Cooper S type vinyl, but I hear it is a right pain in the @$$ to get it right. Vinyl would have been the original finish on a 67 car; mine is like that. The 69 car I had (which ended up in Florida) was also vinyl, but I had to replace that - a scrap from a local upholsterer did the job for me. Looks as though you're also missing the illuminated end of the indicator stalk? Those parts are still available. I replaced Elfies dash rails (top/bottom & sides) with ye olde grained vinyl roof type vinyl (as on BLMC 1300GT's, Ford Cortina's, etc.). It was a perfect match for the old stuff that was getting somewhat grubby. If you go this route (recommended for originality) you will need to temporarily pop out the windscreen for doing the top rail and sides as excess is tucked under the rubber seal. With regards to the sides, (between the top & bottom rails) there are narrow (about 1" wide) shaped metal strips that are are covered in the vinyl with the fwd/aft edges trapped under the windscreen rubber and the door surround rubber seals. Their lower edges are under the top rail covering and the upper edges simply overlaps the headlining. Sorry I can't provide a pattern for these strips without removing my screen (someone out there may have them available for a tracing or you can check out someone else's Elf if you go to one of the Classic Car meets...shouldn't be too dificult to replicate them). The whole issue is stuck down with Evostick having given it time to "go off" per instructions - don't be too impatient else it'll come unstuck in the near future. If your local auto upholsterer can't supply the grained vinyl then make a date for the Classic Car Show or Restoration Show where someone will have some...and its not expensive.....methinks you deserve a vacation in jolly Olde England!! Methinks matt black paint will look like a pig's ear in a few months time (remember the sirry pirrock who put his feet on his girlfriends Yaris dash!!!). Grained Vinyl will TRANSFORM your interior - go for it....for a car as nice looking as yours nowt else will do! superworm wrote: With regards to the sides, (between the top & bottom rails) there are narrow (about 1" wide) shaped metal strips that are are covered in the vinyl with the fwd/aft edges trapped under the windscreen rubber and the door surround rubber seals. Their lower edges are under the top rail covering and the upper edges simply overlaps the headlining. Sorry I can't provide a pattern for these strips without removing my screen (someone out there may have them available for a tracing or you can check out someone else's Elf if you go to one of the Classic Car meets...shouldn't be too dificult to replicate them). I believe they're called A-Post pillar covers. Newton Commercial have them, as well as the proper dash material. I also bought a nice Elf boot board carpet kit from them, though they don't list it on their website. asahartz wrote: Vinyl would have been the original finish on a 67 car; mine is like that. The 69 car I had (which ended up in Florida) was also vinyl, but I had to replace that - a scrap from a local upholsterer did the job for me. Shouldn't have an illuminated indicator stalk on a mkIII should it? 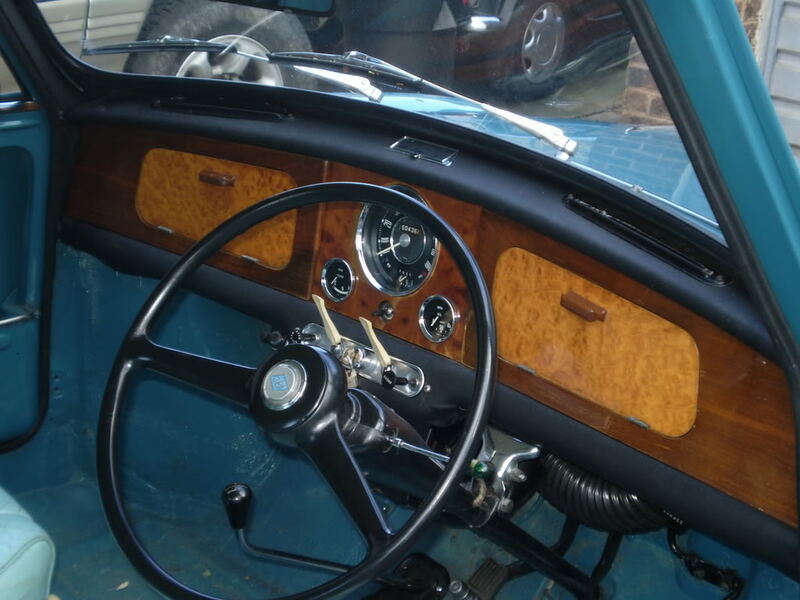 Early Mk111 Elf and Hornets carried over some of the older Mk11 features including the flashing indicator arm, old style heater, lower dash rail, steering wheel centre boss, standard Mini wheel trims and seat design. I think the later Mk111 was introduced early 68. It's a typical BMC and BLMC procedure to use whats on the shelf up first before starting on new stock. After all what would you do with surplus old stock? My 67 Mk III does! As mentioned earlier, the Mk111 was modified early 1968 with the later indicator stalk with horn and main beam flasher. The floor dip switch was replaced with the later stalk and the gearbox gained synchromesh on 1st gear. My Elf June 67 came with the older Mk11 set-up but I have modernised it with a later Mini single stalk indicator and steering lock assembly to add a little more security. As Tony mentioned, they used up old stock where possible and carried these over across the range. The boot catch arrangement is very similar to that used on MGB's of the same period and I'm sure there are similar examples with other vehicles. My 1969 Elf has floor dip switch and a green light on end of stalk! the green end is dameaged on my stalk and the minute you try to operate the dip switch on floor it blows a fuse and all electrics go! Elf Service wrote: Shouldn't have an illuminated indicator stalk on a mkIII should it? Thanks Andrew! Your knowledge never ceases to amaze me! And, like a man in orthopaedic shoes..... I always stand to be corrected! I guess "Rupe" is deemed to be late Mk3 then although his build date was Feb 68. I guess that would explain why my friend has a mark 2 with some Mark 1 bits, because of the new/old stock thing. I found that a local shop has some crinkle vinyl so I will add that to the dash and A pillars. The matte paint is already upsetting me because it is showing my swipe marks from cleaning. I hate having to remove the screen , but maybe I will wait until I paint the car later this year. As for the turn signal stock, it is missing the green E.T. finger. I plan on getting the replacement unit sometime in the future, but the rest of the interior is first. The car is an early MkIII from New Zealand and has late MkII aspects. The motor is even listed as a MkII engine, and is the original. The high beam dip is floor mounted, instrument panel light switch on the dash, E.T. finger. I'd have to say that there was no covering on the dash rails from new since it has the original paint on there and no glue residue. Rusty is the same - a 1968 mkIII but with floor dip switch and "et finger" indicator stalk. i do like that description! I had to upgrade the motor on little Biscuits. The 998 kept popping out of fourth gear and being low on funds at the moment (My brother is getting married and I'm chipping in) I had to manipulate my engines to get what I wanted for the Elf. I have a '65 Morris Cooper that had the 998 taken out of it at some point in history and a 1275 put in it's place. This motor has a rebuilt HIF6 and a new Aldon Yellow dizzy with new wires and coil. The Riley motor will be rebuilt with 9:1 or 10:1 compression and a SW5 cam with a Cooper head, if I can source one. The trans will be rebuilt with a close ratio straight cut set up and will go into my Cooper and will be fed with a DCOE 40 carb and proper intake along with a freeflow type exhaust. I will eventually remove the motor and rebuild it with MED internals and an MED rod change transmission, but for now it will work just fine. Once I decide on a final colour scheme for the car I can paint the engine bay. I used the exhaust that I had when the engine was in the Cooper; LCB with RC40 center exit and will cut and lengthen the tail pipe later this week. The tip just hits the rear valance and causes some fumes to get back into the car through the rusted hole in my boot floor and the vibration is annoying, but will be remedied. So far i really like the added power and really like not having to hold the gear shift in fourth! I love those magnolia dials! I think those original wheels really suit the elf, but then its all about personal preferance isn't it! Just noticed you have a porsche 912, would love to see some pics as I love the look of those cars. hornetob wrote: I love those magnolia dials! I think those original wheels really suit the elf, but then its all about personal preferance isn't it! I like the 5x10 Cosmics too, but I do like the aggressive 6x10 Revolutions too. The 6x10's do seem to make the handling a bit twitchy, the 5x10's handle most all roads just fine and seem quieter too. I have thought about keeping the Cosmics on both my Mini and the Riley. I have two sets and having them both match seems kind of cool. I like the four cylinder better than the flat 6 since the four is lighter and the car has less of a pendulum effect. I plan on a Jake Raby type 4 motor in it in the future. He can make the motor put out 145 to 175hp reliably so I can have flat 6 power with flat four light weight and they are cheaper too! I know what you mean about the cosmics, it would be good to have them on both cars for a bit of fun! That 912 is lovely, I just think that the lines are beautiful and the chrome really suits it. I have been looking for one for a while over here but they seem to go for almost 911 money now which is a shame. Are there many left in the U.S.? If it was cost effective I would consider importing one, at least the body would be a bit less likely to be rotted! Yokohama A032r tyres on 6x10's are the dogs danglies and grip like you wouldn't believe. I have them on my 6x10 revolutions and it seems ok to me. More nimble than my girlfriends Mini with 5x12's and falken tyres. hornetob wrote: I know what you mean about the cosmics, it would be good to have them on both cars for a bit of fun! Zef wrote: Yokohama A032r tyres on 6x10's are the dogs danglies and grip like you wouldn't believe. I have them on my 6x10 revolutions and it seems ok to me. More nimble than my girlfriends Mini with 5x12's and falken tyres. Yeah, had the 032's on a Mini I had a few years back and they were fantastic. My only worry is how long they will last. I didn't have the other car long enough to gauge wear. The twitchy handling with the 10x6's could be down to my worn bushes. I changed the tie rod sets this last weekend and it seemed to make a nice improvement. As soon as I get the tires installed on the wheels I will post more pics of how they look. New wire harness with alternator. I will have pictures and more information once I get the motor back from the engine builder. Graham of Heritage Motors here on Southern California is building it up for me and he said that the bearings were black on top and down to copper on the bottom and the thrust bearings were down to copper. The crank end float was visibly noticeable when you grabbed the flywheel. I would guess at least 2mm or more worth of movement. So my little motor was saved before it had a chance to die.